Angels: Cosmic visitors not of this Earth, some that are human, some that are not, that are constructive who bring great wisdom and often help protect us against destructive events - they are often dressed in bright clothing, have the ability of flight and can appear in spirit. Cherubim: They are the most advanced entities in the universe and if we were to define them according to our own frame of reference here on Earth, they would remind us of the dolphin. The Cherubim appear to be descendant of the dolphin lineage life design code, but evolved into ‘grand design’ in another world, in another star system in existence millions of years before ours. Although historically referred to as Cherubim, more modern accounts tend to refer to them as The Greys. Sacred texts refer to the Cherubim as child-like entities that are not human. They have well developed acutely efficient eyes and wear what look like a dark eye protection as a contact lens of sorts that is adaptable to light. Their black ‘eyes’ invariably give the preconceived notion of evil. Yet these beings are anything but. The notion that they are evil is as much of a misnomer, as it would be to label as evil someone wearing sunglasses. Granted, there has been the occasional case of similar looking entities being involved in dubious practises of ‘farming’ biological material from humanity. Although the Greys that are constructive that 'harvest' human DNA, foetus, eggs and sperm, helping other life out there in the universe, there are some rare cases where Grey entities take biological material for their own interest and do so with little care for the person being abducted. Ancient texts refer to these entities as fallen angels. Thankfully for humanity they appear to be in the minority, outshone by those campaigning for the greater good of humankind. 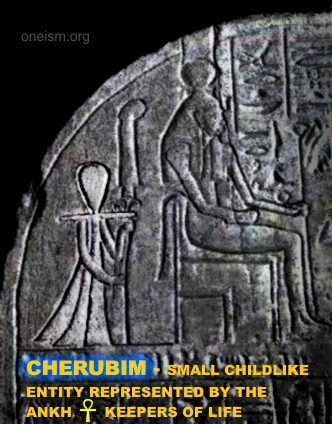 Throughout history there is evidence of the Cherubim, be they in the form of mythological fairies and gnomes, encounters with aliens and accounts of various fertility gods. What these entities seem to be concerned with the most, is the propagation and sustaining of all life forms in all gene pools throughout the universe. If they did not constantly replenish our weakening DNA with other universally common DNA from other human form lineages (and visa versa for other life out there), the human form would be so inbred and so weak and defective, that we would have probably become extinct by now. The Cherubim watch over the Tree of Life and all life in the universe. Hence ‘life’ is the correct interpretation of the sign of the Ankh in Egyptology. The shape of the Cherubim’s head matches that of the glyph. 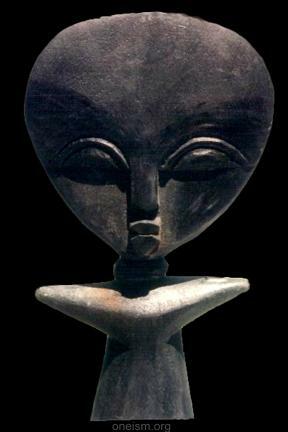 In much the same way, it is also how the fertility gods throughout Africa are represented, as shown here. In Southern Africa, from Zambia down to South Africa this entity is known by many names. I have, much like the well-known Shaman Credo Mutwa, studied all accounts of this entity visiting ancient African civilisations. In South Africa it is well known as the Tokolosh. In mythology right across the globe there are many accounts passed down by tradition. All describe a childlike entity that possesses technology described as magic. Traditional accounts of fairies, gremlins, leprechauns, gnomes, elves, trolls, demons, the list is endless… all seem to describe the Cherubim. As already seen in the Egyptian account of the underworld at The Tree of Life on this website and the Revelation texts that follow, these entities seem to have been in contact with some of history’s most notable people. The famous Renaissance painter and inventor Leonardo Da Vinci was rumoured to have been a member of a secret society in the Dan Brown book, ‘The Da Vinci Code’. I have done extensive research on Da Vinci and have come up with a new theory on the painter’s source of wide-ranging knowledge and his ties with the Cherubim. It almost seems as though his inventions were prophetic because hundreds of years later many of his designs became a reality. Was he a genius or was he somehow connected to the Tree of life, the source of all knowledge? He has left some clues that suggest that it is highly likely that he was uniquely connected to The Tree of Life. If one takes a closer look at what lurks in his famous painting ‘Virgin of the Rocks’ in the London National Gallery, this may well convince many who have seen the way that he has encrypted other secrets into his most important religious paintings. The grand secret lies in the ‘rocks’ and the grand human design code encrypted in virtually all of his other mystical paintings (soft lines have been added to the painting below). Notice how Mary places her hand above the infant Christ’s head. Notice also the obvious angel on the right side the painting (a human type angel with symbolic wings to signify flight). Both the presence of Mary and that of the angel seem to suggest that this was how The Christ was looked after here on Earth, and from above. But there is another angel present, a Cherubim, which the artist seems to have encrypted ingeniously into this masterpiece, but in such a way so as not to incriminate him as blasphemous in any way, in the face of a totalitarian church. Take a close look at the detail of what appears to be a Cherubim peering over Mary’s shoulder perhaps with its hand also poised over the infant Christ. Although many will be inclined to say this is merely coincidence, what Da Vinci portrays in his painting offers a more complete picture of the Christ story. There is also consistent theme styling: Both are angels and they are together… both are looking in the same mysterious direction of all present in the painting. Could they be looking at another grand secret in front of them? The secret that fits the sacred geometry in his paintings and what The Christ is blessing: See Da Vinci’s mystical paintings for the answer. 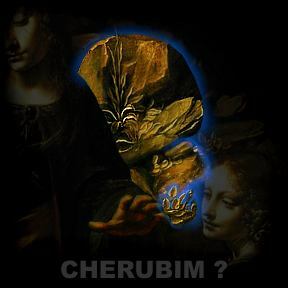 Shown here is the extracted Cherubim detail from the image below it. Da Vinci also appears to have encrypted his knowledge of the star origin secret of humanity in his most famous sketch titled ‘Vitruvian Man’ (see below). Take a close look at how he depicts the human form giving the subject of his sketch an unusual leg and arm stance that is very different from how his contemporaries portray the same. This arm and leg position can be tracked down to even earlier, in a manuscript by Heinrich Agrippa that was released in Germany at the very same time Da Vinci completed his sketch. Perhaps sourced from the 2000-year-old lost manuscript of the Greek writer architect and engineer, Vitruvius. Da Vinci emphasised three dimples in the human form stomach area in an odd kind of way. Only a bodybuilder would have such ‘dimples’, namely abdominal muscles. However it would be anatomically incorrect to have only three dimples! How can Da vinci make such a glaring error? Unless of course if he wanted to conceal a secret. On a defined body one would have these type of ‘dimples’, but there should be anything between six and nine of them. I believe that Da Vinci was re-creating the human-Orion secret presented in the grand design article, where the three belt stars of the Orion star constellation ‘show the way’ as an alignment to the place from where the grand human form physically originated from… the place of three sun-like stars near the Pleiades. 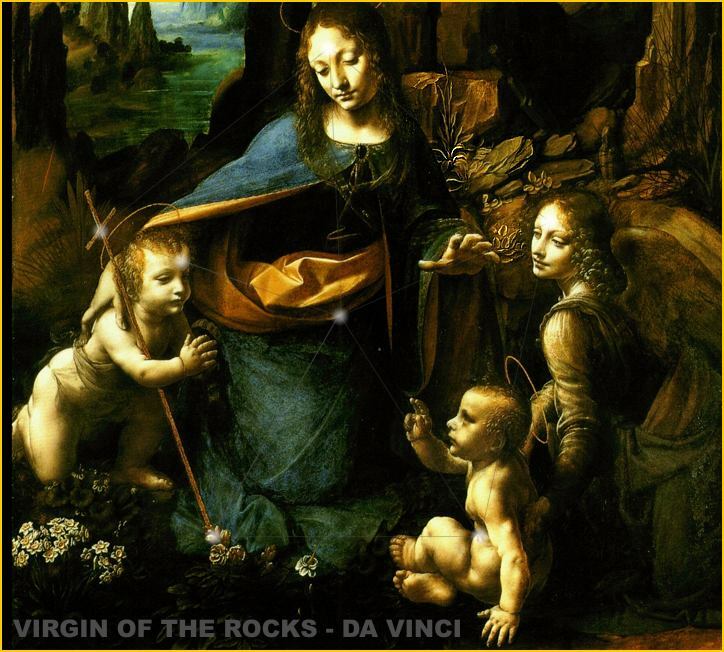 Da Vinci would also have known about The Tree of Life, if what I have identified in the painting below, and the earlier one of the ‘Virgin of the Rocks’, are truly Cherubim hidden in the landscapes. Not only would he have known about The Tree of Life, but would have found a way to incorporate it into a painting involving The Christ, given that the staunch church of the time would have been uncomfortable with this kind of symbolism. Even scholars are now saying the paintings of Da Vinci hold encrypted symbolism. 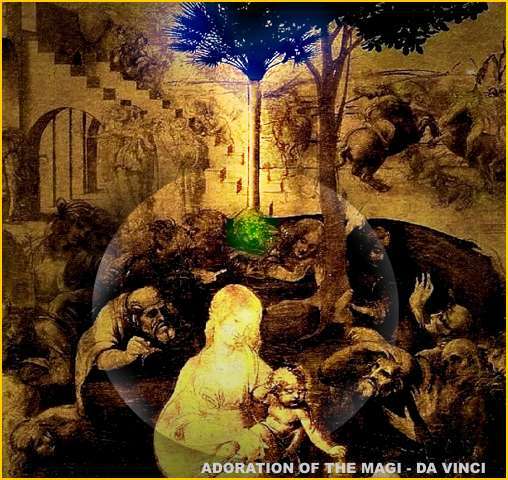 Shown below, in his famous painting ‘Adoration of the Magi’ he inadvertently shows a tree that can be analysed as being synonymous with the Tree of Life. A circle has been drawn in, to show its central positioning in relation to the main subject, Mary together with The Christ child. The tree I identify as the Cosmic Tree is of the same fan spread style used by the Sumerians to portray their Cosmic Tree. What is more, it is positioned on an unnatural looking mound as well as having a perfect pillar representation as its trunk. This is redolent of the Cosmic Tree at the place of The Creation, which is positioned on a mountain. Perhaps in a last ditch effort to make it less noticeable it has been partly obscured by an ordinary looking tree. Another point of interest is the Biblical account of the three Magi. 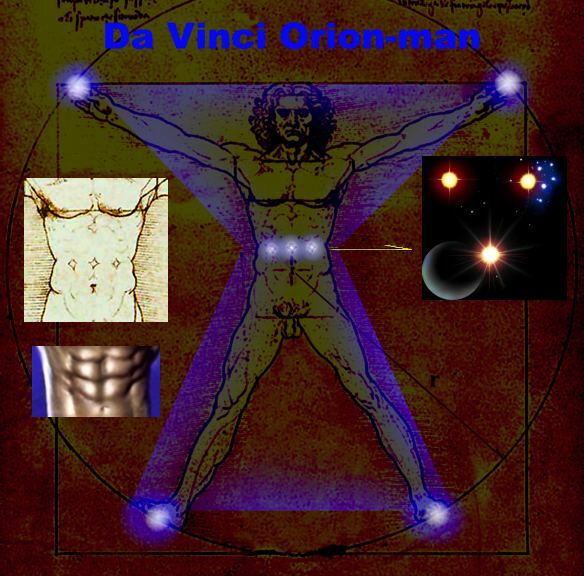 On my Solomon Key website, I present evidence of the Magi representing the three stars of Orion’s Belt … the same three stars that show the way so to speak in Da Vinci’s ‘Vitruvian Man’! 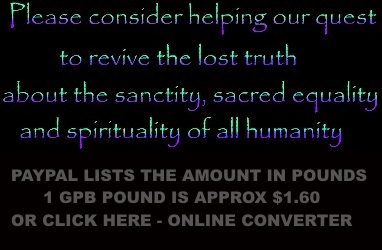 Thousands of people all over the world have claimed to have been visited by these protectors of life. Many believe they are hypnotised to forget their visit, since it is more constructive to one’s life not to be able to remember the emotional event. The reason being, in cases where people with a strong memory of fragments of what may have transpired, much discomfort and hurt was brought into their lives. More often than not, those who have dared to speak of their encounters have been ostracised from family, friends and society. In cases where people have gone for regression hypnosis, there is another terrible misunderstanding that has emerged. It is a given from countless accounts that these entities invariably perform operations on their ‘chosen ones’. These beings are so advanced that they no doubt plant nano-technology implants into people, which will allow communication by thought and tracking for relocation. They do not use destructive life threatening anaesthetics like we use in operations, they simply induce the soul out of the body and allow the subject to ‘watch’ the operation. In the process, the soul’s body veil remains attached to the body with a tiny umbilical thread of light, but the ‘patient’ is disconnected from all pain or feeling. What happens in regression hypnosis has inadvertently given these well meaning entities a terrible name. In regression hypnosis of these operations the subject believes he is still in the body while the operation is being performed. The body veil retains a false record of pain, which really did not happen to the soul. The soul was disconnected from memory of pain completely, but in hypnosis the pain can become reconnected with the ‘false’ memory. The subject under hypnosis will panic and feel convinced that what these entities did was barbaric, and that they themselves are destructive and evil. They wear belts that allow their frail bodies to be more efficient in our greater gravity field that is incompatible with theirs. They walk with what looks like a limp because they are almost flying. They can fly by simply adjusting their body to be resistant to gravity. They can literally walk through solid material like walls by simply allowing the atoms of their body and clothing not to interact with force fields of matter. Due to the fact that matter is 99 % vacuum, the one passes through the other. Their body suits are so smooth and seamless creating the false impression that they are not wearing any clothing. The difference between male and female Cherubim is identical to the difference between male and female dolphins. The male anatomy is completely ‘retractable’ and this is why many contactees believe they are drone like. They seem to use artificial wombs as a convenience and the artificial machine-like wombs allow for greater development of the brain, which becomes virtually double that of the normal development it would undergo in the womb. Normal child birth would be impossible with such a large head and even more reason for artificial wombs. The Cherubim seem to communicate with human contactees by telepathy. It may sound farfetched that a being not of this world can know our language and send telepathic messages. In fact we do not realise it, but we think with ‘emotional pictures’ and then reason subsequent thoughts in words. For example, when you imagines stopping to get a burger for lunch, the mind generates two or so very fast emotional images of perhaps a tasty bite into a burger, followed by an image of you parking in front of the burger shop. This is followed by thoughts in words something like… yes, Cheeseburger… will stop there on my way home. These very advanced entities have probably designed nano-technology implant communication devices that translate the universal language of ‘emotional images’ into transmittable waves where others with implants can receive the outside ‘emotional images’. Privacy of thought would probably be a simple as controlling the transmission distance. The human being is probably one of the most common beings in the universe. Those found in the star systems near the Pleiades are probably our direct ancestors who evolved there under the Creation's blueprint design plan for the perfect being. They were no doubt the people who populated our world that was originally destined for the Neanderthal. There is also a probability that the Neanderthal was deemed to become extinct and that universal law made provision for the colonisation of our planet, especially if the human beings who arrived here were advanced enough to see the future of the planet. To see that an impact event would end the Neanderthal 10 000 years ago. designed by a single Creator of the Universe? It is only the opinion of scientists who are atheists that insist that life and science are the result of coincidence and chance. In other words, our solar system, animals and humans occurred pretty much by luck. These scientists follow with another wild theory that life can probably randomly occur in all sorts of conditions and they expect other advanced alien life to be completely weird looking. Seen in recent documentaries questioning if we are alone in the universe, they depict alien beings that possibly evolved from matter that might not be organic at all and as an example here: weird purple beings with many heads, six eyes, nose on chin, and many arms and legs etc! By all accounts, this approach seems to be an attempt at spreading atheism. 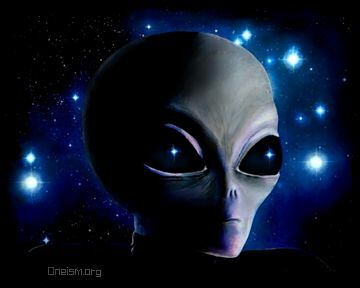 Firstly, what is common in all the strongest cases of celestial visitors in history and that of today is that they have human-like forms. They have a head on top of their body, one nose, one mouth, two eyes, two ears, two arms and two legs. The grand design. This should be expected for two reasons. Firstly because we are most likely the descendants of those that came from somewhere else, thus explaining cases where they are identical looking to us. Secondly, where there are cases of variance, all advanced beings should fit a ‘perfect’ grand design blueprint that should be the design for all advanced life in the universe. Especially if one accepts the probable truth that we have only one Creator, and such a Creator has a blueprint based on perfection for its most advanced life forms. All of humanity here on Earth appears to be descendant of Angelic beings. Sure, there have been claims in our holy books of fallen angels (evil cosmic visitors) that have tried to enslave humanity, but it seems that they failed in most instances. This is probably due to a universal reincarnation judgement law of The Creation, that souls of constructive gentle habit incarnate to worlds of paradise that have super technology to maintain Eden-like happiness… Karma so to speak. Therefore evil souls have less chance of finding advanced technology to use for destructive purposes. Technology was most likely intended only for constructive coexistence and to improve the gift of life and preserve nature. It is up to society as a whole to enforce, through democracy the non-abuse of technology. Especially the misnomer that nuclear energy is safe or clean has to be revisited. It will never be safe or clean, and we may well become victim to it, if it is abused in weapons of mass destruction capable of destroying our planet. Imagine an outside advanced life form looking down at life on Earth. What they will see is manipulation by the powers that be, wanting others to sign their nuclear non- proliferation treaty yet will not end their own privileged use of what can potentially become the most destructive super weapon for our planet. Only when our world's superpower ends their own nuclear ‘privileges’ will they earn the right in the name of The Creation to take action on others that do not do the same.